For the pottery designer, see Charlotte Rhead. Charlotte Thompson Reid (September 27, 1913 – January 25, 2007) served in the U.S. Congress as a U.S. Representative for Illinois from 1963 to 1971. She was a member of the Republican Party. Charlotte Leota Thompson attended Aurora, Illinois public schools and Illinois College. Before getting married and entering politics she was a featured vocalist with the NBC's Breakfast Club with Don McNeill; she appeared under the professional name of "Annette King". On January 1, 1938, Charlotte Thompson married Frank R. Reid, Jr. (who died in 1962). She was the mother of four children: Illinois State Representative, Patricia Reid Lindner, Frank Reid, Susan Reid, and the late Edward Reid. As of 2007 she had eight grandchildren and twelve great-grandchildren. Charlotte was very involved in her Husband's run for congress. He won the nomination over eight men only to die in August before he could run in the regular election. Because she was so involved in her husband's campaign, she was appointed to run in his place. She was first elected to Congress from the 15th District of Illinois in November 1962 and was the only new woman member elected that year. Her first Congress, the 88th, contained 12 women Representatives and 1 woman Senator. She was re-elected for four successive terms. Her initial assignments were on the Committee on Interior and Insular Affairs and the Committee on Public Works. She also served on the House Republican Policy Committee and the Committee on Standards of Official Conduct. Her committee assignments included the Committee on Appropriations where she was appointed to two of its Subcommittees: Foreign Operations and Labor-Health, Education and Welfare. Charlotte Reid served as one of the first six Congressional members on the Board of Governors of the John F. Kennedy Center for the Performing Arts and served on the Board of Governors of the Capitol Hill Club. She addressed the 1964 Republican National Convention in San Francisco and again at the 1968 Republican National Convention in Miami. She was the only member of congress from Illinois to vote against the Civil Rights Act of 1964. In 1965, during her second term, she paid for her own trip to Vietnam to speak with her constituents from Illinois, including 23 men on an aircraft carrier in the China Sea. When she returned she contacted their families. She said that the experience was "One of the most gratifying things that happened to me in Congress." In 1968 she became the first woman to deliver a State of the Union response. In 1969 she became the first woman to wear pants in the U.S. Congress. 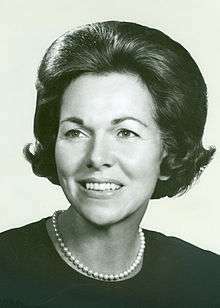 Mrs. Reid left Congress in 1971, in the middle of her fifth term, to become the only woman Commissioner on the Federal Communications Commission. While on the FCC, she served as the Commissioner of Defense focused on emergency preparedness and defense mobilization. Honorary degrees included Doctor of Laws from John Marshall Law School, Illinois College and Aurora University. ↑ "Joni Ernst will be the 16th woman to respond to the State of the Union: Female politicians have been fighting the same sexist attacks for decades.". Slate Magazine. ↑ "Update: First woman to wear pants on House floor, Rep. Charlotte Reid". Washington Post. United States Congress. "Charlotte Thompson Reid (id: R000143)". Biographical Directory of the United States Congress. This article is issued from Wikipedia - version of the 8/1/2016. The text is available under the Creative Commons Attribution/Share Alike but additional terms may apply for the media files.